Grotesque is back, as we learned last issue. He started out as the idle rich pulling art heists for entertainment, but now he has graduated to murder – creative murder, at that. 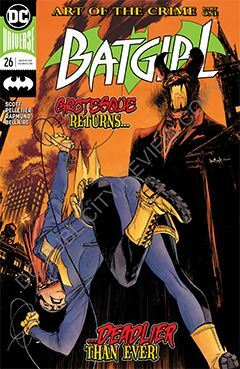 Following a high-speed chase through the streets of Burnside, Batgirl is messed up mighty bad. Her spinal implant that enables her to walk is fried and because it’s attached to her spine, which is attached to her brain, she begins suffering lapses in reality. As Batgirl, such reality breaks are mystery to be solved. As Barbara Gordon, they’re potentially life threatening. What I especially enjoyed about this issue is the combined artwork of Pelletier and Rapmund. It reminds me a great deal of John Byrne’s work in the late 1980s. It has a energetic style that captures the speed of the chase, the flames of catastrophe, and the brutality of Grotesque’s beat-down. But one of the things that impresses me about all the artists that have worked on Batgirl while I’ve been reading it is the attention to subtle details, specifically Barbara’s wardrobe. Too often we suffer through lazy artists, who can draw all manner of space ship or super-hero, but when it comes to a simple car or man on the street, they flounder. They lack the imagination to render something they’ve been seeing day after day for years. Barbara’s day-to-day wear looks natural – something a 20-something would choose to wear – rather than simply putting a dress or jeans & t-shirt on a figure. It’s a minor detail, but it’s this level of attention that gives the visuals of the book (any book) veritas. It makes me sit up and take notice.